Oozing with two cheeses, this pizza is hard to stop at just one slice. Tip: sprinkle fresh basil leaves prior to serving. 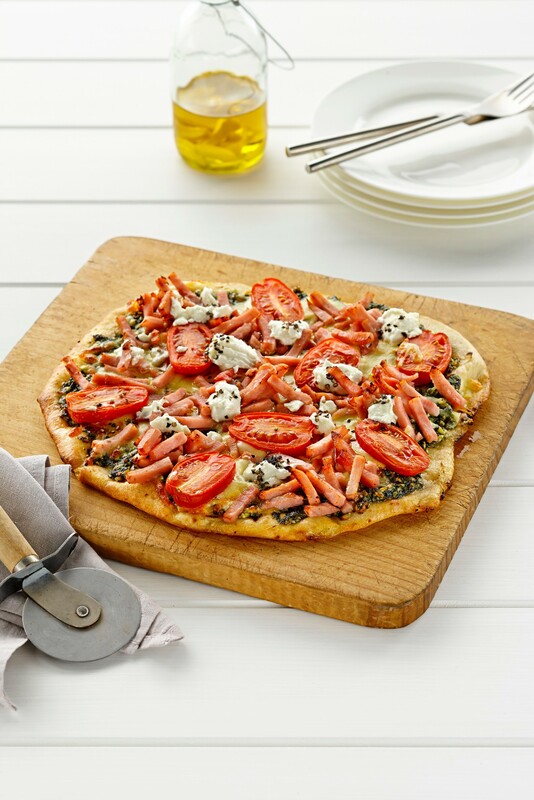 Place pizza bases onto baking trays and spread each with ¼ cup basil pesto. Sprinkle each one with half the grated mozzarella cheese and arrange Don Shredded Ham in little ‘bunches’ on top of each pizza. Arrange half the tomatoes in between the ham on each pizza. Bake in preheated oven at 180°C for 10 minutes. Remove from oven and top with soft feta cheese and a sprinkle of cracked black pepper. Drizzle each pizza with a little olive oil and serve cut into wedges.